Effectively, low-emissivity glass will reflect energy back into a building, to achieve much lower heat loss than ordinary float glass. 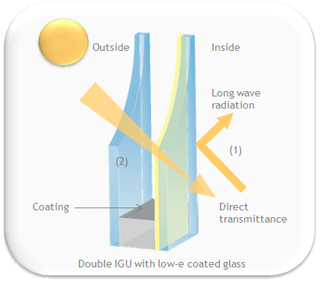 (2) Allowing high transmission of the solar radiation (short wave radiation) through the glass to benefit from passive solar heat gain through the glass. During the winter, low-emissivity glass can reduce heat loss while allowing high levels of valuable free solar gain to heat buildings with no significant loss in natural light. In the summer, however, it can become uncomfortably hot. To maximise energy efficiency all year round, the ideal glazing solution often combines solar control and thermal insulation. Heat loss is normally measured by the thermal transmittance or U-value, usually expressed in W/m2K. In its most basic terms, the lower the U-value, the greater the thermal insulation, however, the amount of free heat energy from the sun, the solar gain or g-value can also have a big impact. through to Pilkington Suncool™, Pilkington Solar-E™ and Pilkington Eclipse Advantage™ which provide both low-emissivity and solar control properties in a single product.